Today I am cooking a very traditional Dutch dish called Boerenkool (Cow Cabbage or Tree Cabbage?) 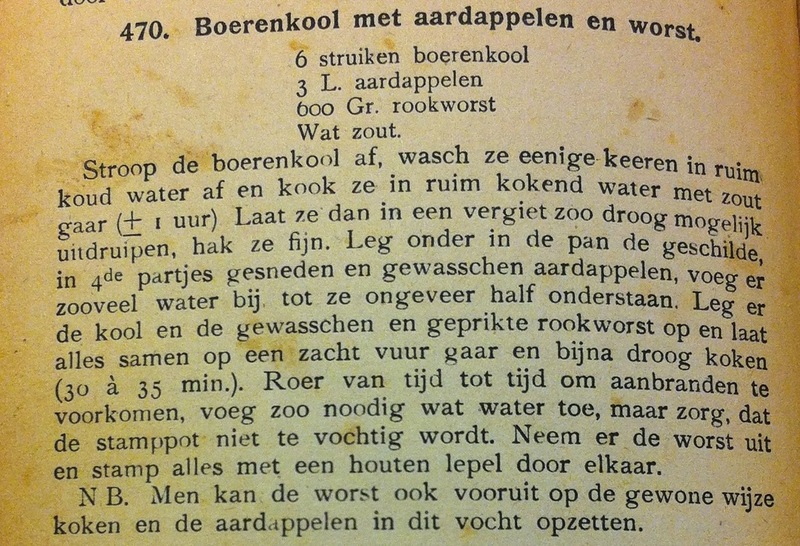 with Rookworst (smoked sausage), using the cookbook my grandmother Gerda Smit-Goedhart had in use when she was attending the Amsterdamsche Huishoudschool in Amsterdam around 1912. 100 years ago. 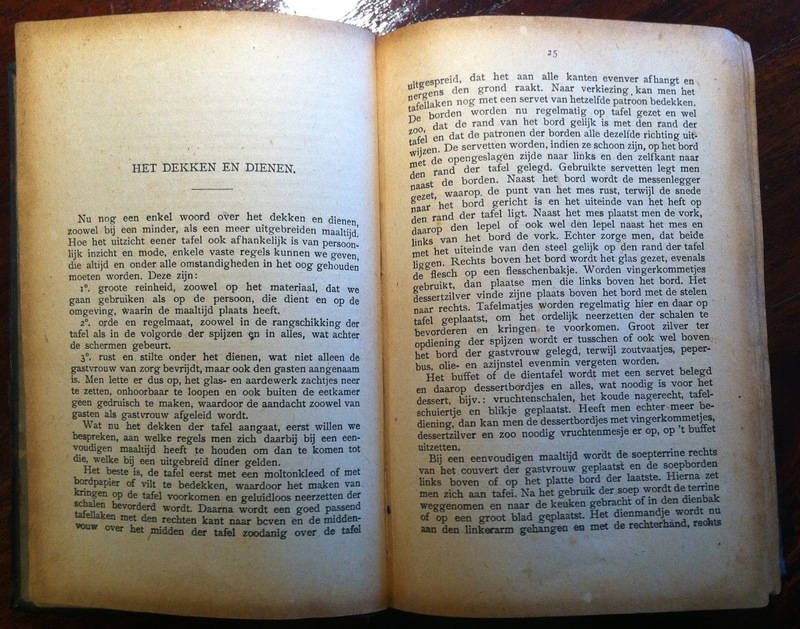 Enkele recepten werden ingelascht, op nieuwe vindingen werd de aandacht gevestigd, het gebruik van boter en eieren ingekrompen of door andere dingen vervangen, waardoor ik hoop, dat het boek aan bruikbaarheid gewonnen heeft. C.J. WANNEE, voorheen leerares in Koken en Voedingsleer aan Die Inrichting. The fact she describes how the use of eggs and butter was reduced to a minimum in this book-print, makes me wonder to what extend there was a shortage of these ingredients back in 1912. Was there a birth-flu and mad-cow disease happening one hundred years ago? Reading the introduction, my eyes were caught by the following pages: How to set the table and how to serve dishes, the old-fashioned proper way. Extreme sanity should be in place, both on material that we will be using, personally with regards to the ones who are going to serve the dishes, as well as on the surrounding (table) where the meal is being consumed. Rest and silence while serving, so that it does not only liberates the host from all her worries, but also positively surprises guests. One should pay particular attention to placing the glasses and plates in a silent manner, walk in a manner one cannot hear and not distract the attention of the host and hostess. How come this took 30-35 minutes to cook in water? Nowadays, 15-20 minutes are sufficient. Could this be the influence of today's crop manipulation?